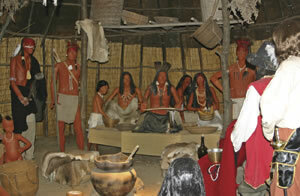 The Lenape Village at historic Waterloo Village was created to help visualize the past. The valleys of Northwest New Jersey, scooped out of the earth's surface by the glacial retreat, left a fertile area teeming with wildlife that eventually became home to the first paleo Indians around 8600BC., beginning a native American history from the archaic period to the woodland culture of the Lenape, or Delawares. An Algonkian speaking people, the Lenape tribe was one of the most advanced and civilized in the eastern US. The culture flourished until the arrival of the first European fur traders in the mid 1600s and the inevitable procession west, spurred by copper mining near the Delaware River and trade along the old mine road from Philadelphia to Kingston, NY. Firmly entrenched in the Upper Delaware River Valley, known as the Minisink, and throughout Northwest New Jersey for thousands of years, Lenape civilization is commemorated on our modern map with familiar names like Kittatinny, Allamuchy, Musconetcong, Netcong, Pahaquarry, Hopatcong, and many others. Archeological sites have yielded a multitude of artifacts that inform us of their culture. The most remarkable local excavation occurred over a seven year period at a place called Dark Moon in Frelinghuysen Township. 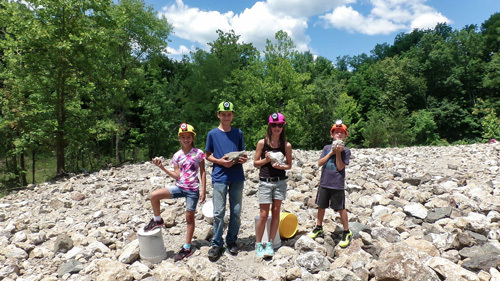 At this ancient arrowhead factory, the Lenape quarried flint from the limestone-rich hills around the site, manufactured thousands of flint points, and buried them for later use. The lodges, huts, pottery and agriculture implements found there with the lode of weaponry are an important part of our academic understanding of how the Lenape lived. More informal excavators have picked wheelbarrows full of arrowheads from farmers' fields. Those days, of course, have vanished along with the arrowheads, although, for scholars, the area still promises a lode of material for interpretation and analysis. Only a rough sketch of a robust culture remains; we know nothing of the human deeds and dramas that occurred. 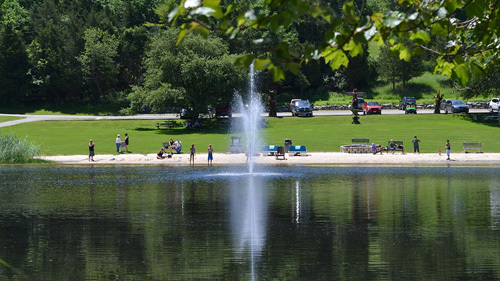 Located in Allamuchy Mountain State Park, Sussex County, on an island in Waterloo Lake, the Lenape Village—called Winakung ("Place of Sassafras")—is surrounded by thousands of acres of wooded forests, stone cliffs, streams and marshes, home to beaver, osprey, and the occasional bear. It is a place of wonder and a land seemingly left alone by time. Here you can walk 400 years into the past and experience an ancient and gentler way of life. Once considered one of New Jersey's best school trips and a popular tourist destination, the Lenape Village has suffered from neglect in past years. Bark lodges were left to crumble, dugout canoes rotted, mortars and pestles decayed, and the exhibits were removed or ruined. Thanks to an intense concern for Historic Waterloo Village and the foresight to save its valuable assets, the State of New Jersey Department of Environmental Protection took over operations at Waterloo in early 2007 and, together with the help of Lenape Lifeways, Inc., restored this unique outdoor exhibit. Dotted with bark wigwams, longhouses, native garden, fishing, hunting, and cooking areas, the village revives the Lenape world as it might have been in 1630, when European traders visited Indian communities to barter metal pots, iron axes, scissors, cloth, glass beads and other items for the Indians' furs and skins. Totally reconstructed, one bark longhouse measuring 60 feet by 20 feet has been newly furnished with benches, fireplaces, animal furs woven baskets, copper pots, metal trinkets and other paraphernalia replicating a trading scene. 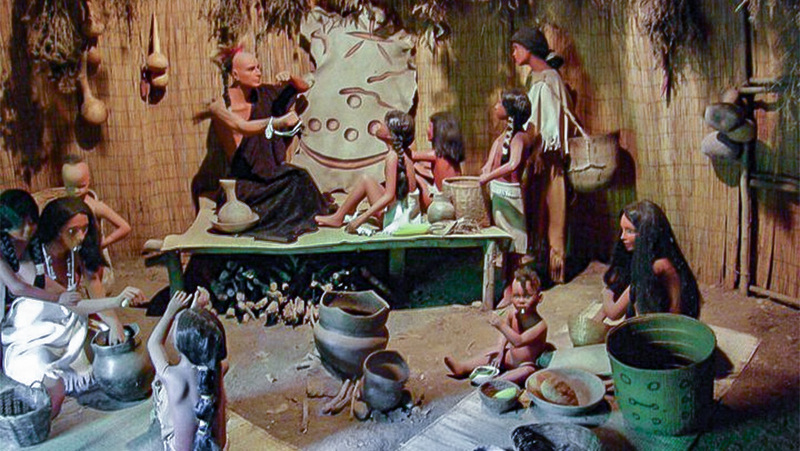 Fifteen mannequins portray two visiting Dutch traders and a group of elders, braves, women, children and infants. 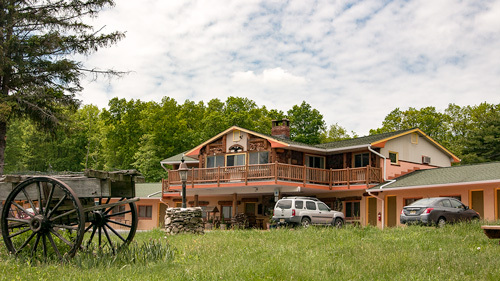 Another 40-foot long house, like the first, has been refurnished with mat-covered bunks and shelves holding baskets, pots and pelts. Countless braided ears of corn hang from the domed roof. At one end, a seated woman uses a carved spoon to stir the contents of a large clay pot boiling over a fire, while women and children engage in various activities nearby. A storyteller entertains a small child as an interested mother looks on. In one area of the Island a wigwam is being built by a newly married couple; in another a traditional herbalist and shaman can be seen attending a sick child. A boy spears fish from a canoe in the Musconetcong River. A hunting trail equipped with snares and deadfalls shows the Indians' methods of catching wild game and food. Dugout canoes are beached at the edge of the island, while a boy spears fish from a canoe in the lake. A fish weir encloses part of the Musconetcong River, and fishnets are stretched to dry. Elsewhere on the island are a sweat lodge, burial plot with grave markers, and a sacred precinct marked by poles carved with effigy faces—twelve in all, as Lenape tradition required. Visitors may catch sight of the Mesingw or "Living Solid Face", who wears a bearskin outfit with a red and black mask. Or one of the "little people," spirit pranksters who cause people to trip on roots or suffer other annoyances. Smaller bark or mat covered houses are located throughout the island; each with its own fireplace complete with pottery cooking vessels, mortar and pestle. A short distance from the bridge to the Island, a simulated archaeological excavation provides an overview of the methods and tools used by archaeologists in the Northeast. Different levels show such diverse features as mastodon bones and Paleo-Indian artifacts, human burials (plastic reproduction), chipped stone implements, fire pits, pottery fragments, and historic trade goods of old which help interpret 12,000 years of Indian occupation in New Jersey. Winakung is a place of wonder once again, believable and archaeologically correct. The shapes and sizes of the houses are patterned on those excavated at Minisink Indian sites in the upper Delaware Valley. The stone tools and pottery vessels have been modeled on excavated specimens or patterned after established ethnographic models. The NJ Department of Environmental Protection is committed to re-opening not only Winakung, but also the historic village of Waterloo, and work progressed slowly on stabilizing and preserving the various structures. 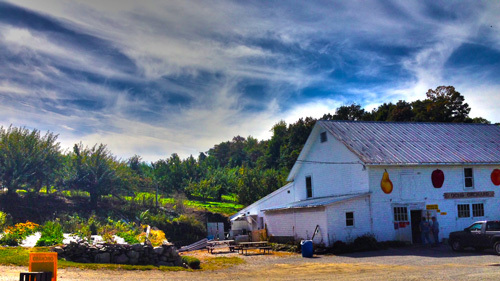 Waterloo was a 19th century community that grew up along the Morris Canal, and boasts an entire canal town including period houses, grist- and saw-mills, general store, blacksmith shop, carriage barn and numerous other attractions. An enormous restoration effort, it may take some time to complete. 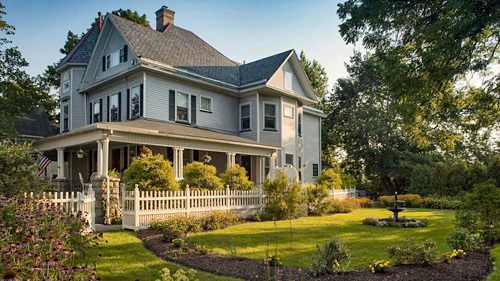 Programs at Winakung are now supervised by the New Jersey Historic Sites office. The grounds at Waterloo Village are open every, including portions of the Lenape Village. To see the entire exhibit, tours will be offered every Saturday from June 29 thru Sept. between 10am and 4pm Tours are free, but there is a $5 parking fee a Waterloo. For more information, please call 973-347-1835, check the Facebook page, or email.